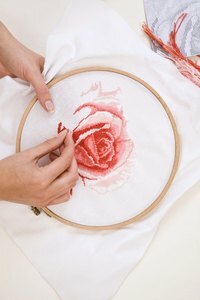 Cross stitch is one form of needlework that enables a stitcher to use embroidery floss to create either simple or intricate designs on Aida cloth, linen or evenweave fabric. The "count" of the fabric -- how many threads per inch -- along with the stitch method -- over one thread or over two threads -- and the stitch count of the design dictates the size of the finished piece. All these calculations come into play when you determine what size fabric you need to start your project. Note the thread count of your fabric. Aida is commonly found in 14-count, though it is readily found in counts from 6-count to 18-count. Aida is stitched over one thread so no calculation is needed. Linens and evenweaves are commonly found in 28-count or 32-count, though a wide range of counts are available. For most projects, linens and evenweaves are stitched over two threads. Divide the thread count by 2, so a 28-count evenweave would be stitched as a 14-count and a 32-count would be stitched as a 16-count. For this example, let's say you have fabric you'll stitch as 14-count. Check your pattern for the design count -- the stitch count of the design's width and height. If there is no design count given on the pattern, count the number of stitches in the design's maximum width and height. For this example, let's say the stitch count is 140 stitches by 112 stitches. Divide the stitch count of each dimension by the thread count. For this example, you'd divide 140 by 14 to give you a width of 10 inches. Then divide 112 by 14 to give you a height of 8 inches. Your stitched design will be 10 inches by 8 inches on 14-count fabric. Add the allowance you want around your design. Remember you need to have a margin around the design and then enough fabric to finish your project. If your finished project will be framed, you may want about an inch showing around the outside of the design, maybe another inch of mat and then another inch or more to lace the fabric on the mount board. Figure at least 3 inches allowance, and maybe up to 6 inches, on all sides of the design. For this example, figure a 4-inch allowance. Take the 4 inches, double it and add it to your design size. For this example, add 8 inches to the width and height to give you a fabric size of 18 inches by 16 inches. If you wish to make your finished design larger, use a lower thread count fabric. If you wish to make your finished design smaller, use a higher thread count. Using the example design, if you use 11-count Aida cloth, your finished design will be 12 3/4 inches by 10 1/8 inches and require a piece of cloth 20 3/4 inches by 18 1/8 inches. If you use 18-count Aida cloth, your finished design will be 7 3/4 inches by 6 1/4 inches and require a piece of cloth 15 3/4 inches by 14 1/4 inches. What is the Difference Between 14 and 18 Aida Cloth?